The Lucifer archetype has been associated with knowledge and technology since antiquity, in a positive light (the Prometheus myth) and a darker sense (Satan and the Tree of Knowledge in the myth of the Fall). Which side of this powerful archetype will triumph in the future? 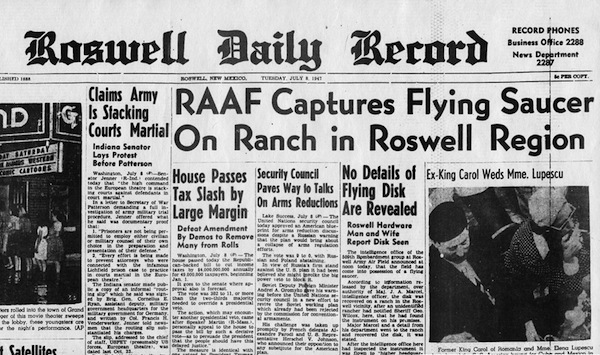 The events at Roswell in July of 1947 did not happen in a vacuum. They occurred within one of the most extraordinary periods in human history, particularly from an esoteric point of view. They would spark a chain of events that would change the entire world. So much of the technology we take for granted today emerged from American Telephone and Telegraph's Bell Telephone Laboratories, or Bell Labs for short. Starting in 1947 with the first solid state transistor, Bell Labs' army of top flight scientists and engineers shook the world with one game-changing technology after another. Whether or not you believe that technology came from somewhere else, one thing is clear; Bell Labs, the Roswell event and the links between them are drenched to the bone in occult symbolism, so much so that you can't help but wonder if both the skeptics and the believers haven't got the story all wrong. Long after the development of the transistor, Bell Labs was playing with alien (and occult) symbolism, specifically with an operating system that was designed to replace UNIX. Plan 9 from Bell Labs is a research system developed at Bell Labs starting in the late 1980s. In Plan 9, each process has its own mutable name space. A process may rearrange, add to, and remove from its own name space without affecting the name spaces of unrelated processes. Included in the name space mutations is the ability to mount a connection to a file server speaking 9P, a simple file protocol. Was this an inside joke among nerdy programmers or was it some kind of signal as to the origin of some of Bell Labs' world-changing technology? Before you answer that remember that Bell Labs would take a very strange semiotic term in the mid 90s, one which creates a spiderweb of connection leading all the way back to ancient stories of technologies falling from the heavens. Soon after Plan 9 from Bell Labs was released, Bell Labs became Lucent Technologies. The conspiracy underground, already reeling from a series of shocks beginning with George Bush's New World Order speech on 9/11/91, went into conniptions. In a way, their fears weren't entirely unwarranted. Shortly after the Lucent renaming in 1996, the Plan 9 project released a development of their work as the Inferno OS in 1997. This extended the 'Lucifer' and Dante references as a series of punning names for the components of Inferno - Dis, Limbo, Charon and Styx. I knew all about this- my wife worked at Bell Labs and was there for the changeover. Bell Labs and Lucent were a major part of our lives for several years. But like with so many of these symbolically-charged entities, it seemed built to be dismantled. As if part of some strange ritual or something. 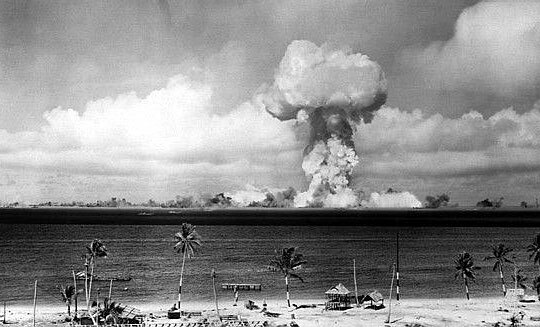 Following the bombings of Hiroshima and Nagasaki in August of 1945, the Japanese would surrender and World War II would be over. Much of Europe lay in ruins and tens of millions were dead. And in a small, obscure cave in Egypt, the Nag Hammadi Library would be found in December of 1945, allowing the ancient Gnostics to speak for themselves after nearly two millennia. The US Army Signal Corps (inventors of the modern printed circuit board) would kick off the Space Age on January 10, 1946 with Project Diana, in which they bounced radar signals off the Moon from Fort Monmouth, NJ. Perhaps knowing Diana was going down, Jack Parsons and L.Ron Hubbard began the Babalon Working in Pasadena, CA, which lasted from January to March of 1946. 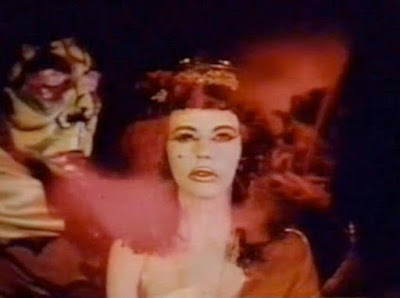 Some accounts would claim that Hubbard and Parsons encountered an alien in the Mojave Desert on January 18, the same day Marjorie Cameron appeared at the Parsonage. In the midst of the Working, the so-called Ghost Rockets began appearing over Scandinavia February 26, 1946. Thousands would be seen through that year. At least one would be reported as having crashed, significantly in the month of July. Two days after the first Ghost Rocket was sighted, Parsons went alone to the Mojave, where he claimed he encountered the goddess Babalon whom he said dictated the Liber 49 to him. On July 1, 1946 the US began Operation Crossroads, the testing of powerful nuclear weapons. This would allegedly attract the attention of UFOs, who were reported to have deactivated nuclear weapons on many occasions in the US and Soviet Union. In folk magic, crossroads were places you went to make deals with demons and other dark spirits. Starting in November another remarkable series of finds would begin, this time of the Dead Sea Scrolls, the sacred texts of the Jewish sect known as the Essenes. Their discovery would ultimately create an enormous controversy within the Church and without, with one prominent researcher eventually claiming that Christianity was a psychedelic mushroom cult. In December, the Viet Nimh would declare war on the French occupation, beginning a long and costly conflict that would last for nearly 30 years and have grave consequences for the United States. On January 8, 1947 David Robert Jones, better known to the world as David Bowie was born in England. Also that month, Z Division moved its operation to Sandia base, later Sandia National Laboratories, the primary nuclear weapons lab in the nation. AT+T would run Sandia for the next five decades through its Western Electric subsidiary. 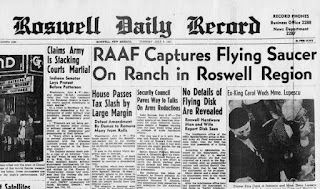 As Peter Levenda points out, this is also the year Sergeant Pepper taught the band to play: “Twenty years ago today...” That would be June 1, 1947, for anyone keeping score at home, a month before the Roswell incident began and the month in which UFOs became a national obsession. On June 21, Harold Dahl claimed to have seen six UFOs near Maury Island in Puget Sound, WA, which would earn him the first modern "Men in Black" encounter. Not too far away, businessman Kenneth Arnold would have his famous UFO sighting on June 24th, a very powerful day in a number of ritual calendars. Then came Roswell. UFOs would begin showing up on radar on July 1st, exactly a year after the start of Operation Crossroads. Curiously, New Mexico is the 47th state of the Union. As UFO conspiracy researchers never fail to point out, the National Security Act was then signed by President Truman on Sept 18, 1947, ushering in the CIA and NSA. Shortly after, the US Navy begins Project CHATTER, a precursor program to MK Ultra. In October Arthur Young left Bell Labs and embarked on a path that would lead him to the Council of Nine. In what may or may not be a coincidence, what reads like the first channeled dispatch from the Council of Nine hit the stands that same October in the form of "Son of the Sun," written by occultist Millen Cooke and published in Fantastic Adventures, edited by Ray Palmer. Also that month the first use of the "computer" as we understand it today is used. In December of 1947, Aleister Crowley died in England. His ashes would be buried in New Jersey. Surely he knew that the 47th problem of Euclid was of special significance to Freemasons. I wonder if he appreciated the irony. The Roswell events themselves are so laden with symbolism that one seriously has to wonder if what we saw was in fact some kind of ritual and not any kind of accident at all. The crash was said to take place on the Plains of San Agustin, named after the Church father Augustine of Hippo, who wrote extensively on the nature of "demons of the air." Legendary UFOlogist John Keel would claim that the UFO phenomenon was in fact nothing but the latest manifestation of these demons, who date back to ancient Mesopotamia and are studied by so-called Assyriologists. Modern UFO demonologists are predominantly Evangelical Protestants, but I'm certain they've taken note of Augustine's writings. 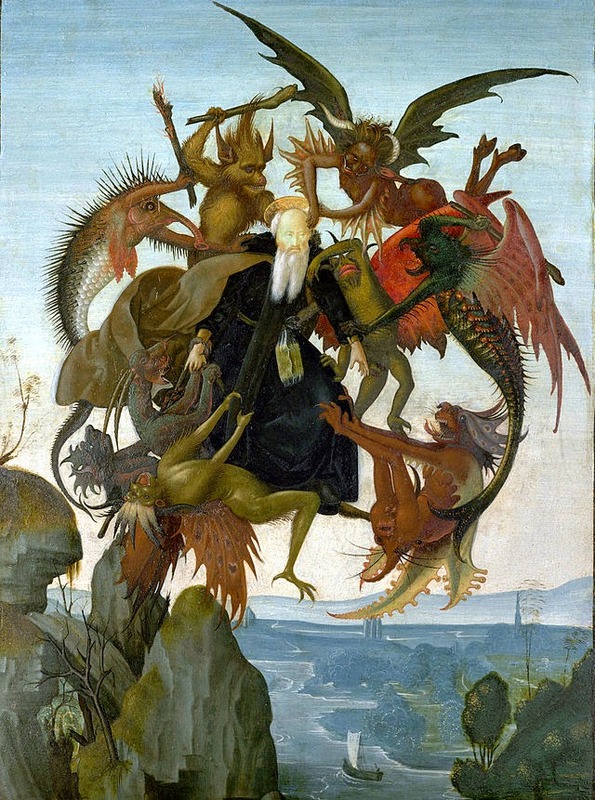 The same Apuleius, when speaking concerning the manners of demons, said that they are agitated with the same perturbations of mind as men; that they are provoked by injuries, propitiated by services and by gifts, rejoice in honors, are delighted with a variety of sacred rites, and are annoyed if any of them be neglected. Among other things, he also says that on them depend the divinations of augurs, soothsayers, and prophets, and the revelations of dreams, and that from them also are the miracles of the magicians. Which of course are indistinguishable from any sufficiently-advanced science. 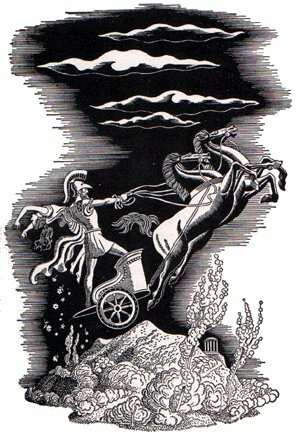 In classical mythology Corona Borealis generally represented the crown given by the god Dionysus to the Cretan princess Ariadne and set by him in the heavens. Dionysus was not only one of the primary gods of the Mystery religions, he offers us many characteristics later attributed to Lucifer, in particular in that he granted secret knowledge, particular that of the sciences. For instance, The Dionysian Artificers were a guild who operated throughout the Greco-Roman world, who were masters not only of astronomy and geometry but also of architecture (Dionysus also traveled with daimons in his entourage). Piskies, Pixies, Elves, Faeries and Nymphs are common residents of sacred wells and waterways. Sometimes these Sprites and Faeries also became Christianized by the new religious order in Britain. St. Neot was said to be only 15 inches tall. He spent his days immersed in the well praying and performing miracles with birds and other animals. Sacred Well is situated at the south to the Great Propylaia (left from the outside). In Classical Antiquity, this was thought to be the Kallikoron (Well of Beautiful Dances). This name comes from the legend that when Demeter, who lost her daughter and desperate, sat down at the well (or fountain), women of Eleusis danced to console her (Pausanias 1.38.6). But the well in question is now thought to be situated in the Telsterion. Demeter was also worshipped at Samothrace, home of the Mysteries of the Great Gods. There's another figure, also linked to Samothrace, whose adventures bring us right back to Roswell in many powerful symbolic ways. Cadmus...in Greek, Roman and Phoenician mythologies, was a Phoenician prince, the son of king Agenor and queen Telephassa of Tyre and the brother of Phoenix, Cilix and Europa. 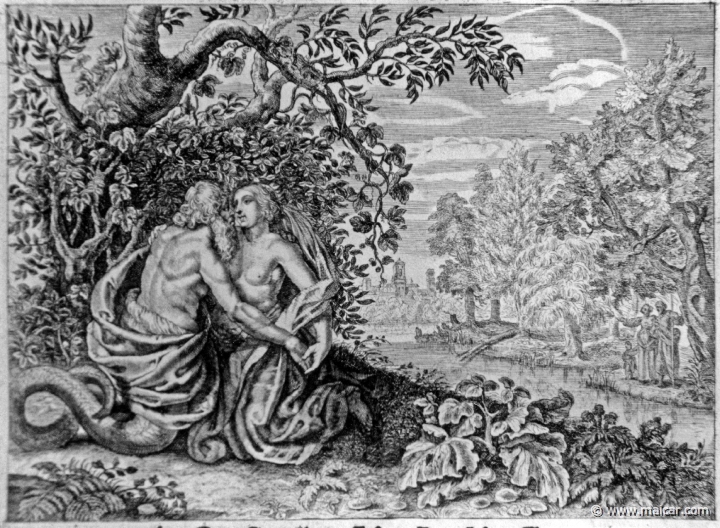 After his sister Europa had been carried off by Zeus from the shores of Phoenicia, Cadmus was sent out by his father to find her, and enjoined not to return without her. Cadmus was then said to journey to Samothrace, where he and presumably his mother were initiated into the mysteries of the Great Gods. Unsuccessful in his search, he came to Samothrace, the island sacred to the "Great Gods" and the Kabeiroi, whose mysteries would be celebrated also at Thebes. Cadmus did not journey alone to Samothrace; he appeared with his "far-shining" mother Telephassa. The origin of Cadmus' name is not entirely certain- one interpretation is that comes from the Phoenician Greek* kekasmai, meaning "to shine." Which is the actual definition of Lucent. Not "light bearer" but shining. In other words, it's not Lucifer Technologies, but in fact CADMUS Technologies. "While seeking water he [Kadmos] came to the fountain of Castalia, which a Draco, the offspring of Mars [Ares], was guarding. It killed the comrades of Cadmus, but was killed by Cadmus with a stone. Under Minerva’s instructions he sowed the teeth and plowed them under. From them sprang the Spartoe. These fought among themselves, but from them five survived, namely, Chthonius, Udaeus, Hyperenor, Pelorus, and Echion. In modern fringe UFOlogy, Reptilians are said to originate in the Draco system. Which is convenient, I guess. The Well of Mars is interesting for another reason, one I should mention. That being that Mars is the Red Planet, of course. So it's also the Well of the Red Planet or even, if you like, the Red Well. And know what else is red? I'll give you a hint, violets are blue. Cadmus would marry Harmonia, an event that the gods themselves would attend and the Muses provided the entertainment for. Cadmus would then travel the world and initiate mortals into the Mysteries, presumably the Mysteries of the Great Gods. But you know how these stories end- on a down note. 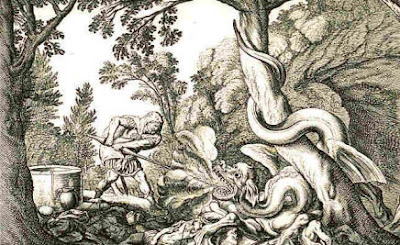 Cadmus was deeply troubled by the ill-fortune which clung to him as a result of his having killed the sacred dragon, and one day he remarked that if the gods were so enamoured of the life of a serpent, he might as well wish that life for himself. Immediately he began to grow scales and change in form. 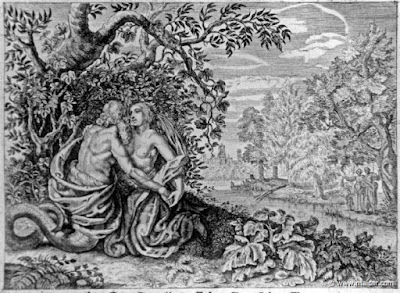 Harmonia, seeing the transformation, thereupon begged the gods to share her husband's fate, which they granted (Hyginus). The Cabiri, whose native land was Lemnos and whose principal sanctuary was in Samothrace are said to have had Hephaestus for a father, or at least for a divine ancestor (Strabo, Geo 10.3.21). Marine powers, they are explicitly identified as crabs by Hesychius: "The Cabiri are crabs (karkinoi), animals particularly honored in Lemnos, where they are held to be gods. It is also said that they are the sons of Hephaestus." Like Hephaestus, whose descendants they are, the Cabiri are metallurgists. "The Great Gods came to Earth in a flaming star, which shattered the rocks when it crashed into the island of Samothrace, there the Great Gods made their home. They are lords of the terrifying tempest. Just so we're absolutely clear on this, Cadmus and Lucent are the same word. Lucent Technologies was said to have received secret technology from the beings who crashed from the sky at Roswell. Cadmus was said to have received secret knowledge from the beings who crashed from the sky at Samothrace and is connected to the Mars Well. Certainly, Hephaestus is master of fire, but not just any fire. He is essentially the technical fire, the fire that is used to accomplish the tasks of artisans, not the heart fire, which is the domain of Hestia, nor the celestial fire, the lightning of Zeus. Moreover, Hephaestus works only noble metals: gold, silver, bronze, brass, etc....for Hephaestus, metallurgy proves to be inseparable from magic. 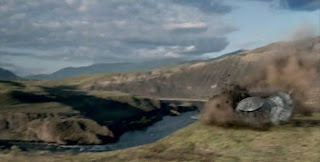 Given all this symbolism and ancient parallels, it becomes harder and harder to see Roswell as Reticulans crashing the interstellar station wagon. It starts to look like something else, something entirely ritualistic and arcane. Perhaps where all this technology takes us will tell us whether this is Luciferian in the Satanic sense or Luciferian in the Promethean sense. Hephaestus' Roman counterpart was Vulcan, a connection which should speak for itself. His counterpart in Egypt was Ptah, well-known to Secret Sun readers as the model for the Oscar statue. Ptah was also known as the "Disk of Heaven" and built the heavenly boats that took the pharaohs to their eternal abode in the stars. A few years back I looked at the Barney and Betty Hill abduction and noted the parallels between it and Aleister Crowley's time in the New Hampshire town of Hebron. The Hills claimed to have awoken from their hypnosis while driving parallel to Hebron on Route 3 (now Interstate 93). That got me to thinking about Roswell again and the issue of coordinates, a bit of an obsession of mine. Alignment is a powerful tool in esotericism. 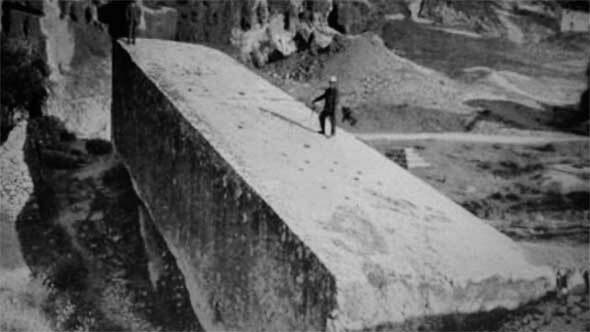 Researchers have noted the alignments of the Giza Plateau, Teotihuacan, America's Stonehenge, the Millennium Hotel, Washington, DC, and other important sites. The late David Flynn looked at the alignments encoded into Roswell from a Christian apocalyptic perspective, connecting it to his beliefs about the year 2012, and others have picked up from his work. I had some issues with some of his findings so I decided to look into the coordinates myself. Not only Roswell but other major landmarks in UFOlogy. The exact latitude for the Roswell Crash Site on the Plains of San Agustin is 33.968418, which rounds off to 34 degrees, zero minutes North (34º0'N). That is also the exact latitude of Baalbek, the massive megalithic site that is a favorite of ancient astronaut theorists. Again, we see the mysterious Phoenicians appear in a context that makes no exoteric sense. 34º0' is also the latitude of the Socorro, NM UFO event, the sighting that got a huge amount of attention in 1964. Theorists like Flynn credit Baalbek to the work of the Watchers, who fell to earth at Mount Hermon, which stands at 33°24′58″N. If you follow that line almost halfway across the planet you'll find yourself standing smack dab in downtown Roswell, NM. The famous Aztec, NM crash was on 36°49′ N. If you travel east you'll eventually find yourself on the southern border of Harran, the mysterious ancient city where the ancient UFO cult known as the Mandaeans was born. Legend has it that the Babylonian king Nimrod, the famous architect of the Tower of Babel, originally established this mysterious citadel. The famous Kecksburg, PA crash took place at 40°11′N. That line would take you off the coast of Lemnos, where Hephaestus was taken when he was thrown into the ocean from Olympus, so that's a good a splashdown point as any. Finally, Area 51 is allegedly at 37°15'N. Following that line east will take you to the heart of Sicily, ultimate birthplace of the ancient Eleusinian mysteries. Why is that? Because Sicily is where Persephone was abducted by Pluto, the King of the Underworld, a story that made a tremendous impression on would-be Area 51 producer Chris Carter. Sicily was the primary cult center for Persephone in the ancient world. Note also that Pluto was identified with craftsmen, and possessed a helmet that resembled the kind of cloaking technology they're working on at Area 51. The Hermeticist Ficino said Pluto was a Demiurge, "a daemonic 'many-headed' sophist, a magus, an enchanter, a fashioner of images and reflections, a shape-changer of himself and of others." And of course Lucifer later took on many of his attributes in Christian folk mythology. Remembering the many parallels between the Eleusinian Mysteries and the Mysteries of Isis, we should note that 51 is 3x17, the date of Osiris' death and the Lamentations of Isis and Nephthys. Osiris would be revived by Isis and take his place as Lord of the Underworld. I don't know about you but that's one or three too many coincidences for me to swallow. UPDATE: While I was working on this piece, some interesting events took place out there in Meatspace. • Footage of a mystery mushroom cloud over Area 51 leaked onto the Internet. • Former Speaker of the House John Boehner called Senator Ted Cruz "Lucifer in the flesh." • Sony announced a 666% increase in profit just in time for Walpurgis Night. Note: I'm running these posts out of order. I'll run the post originally meant to run before this later. º And as David Flynn and others have pointed out Sidonian, or Phoenician, is homophonic with Cydonian, referring to the notorious Martian plain where some have argued evidence of artificial construction can be found. 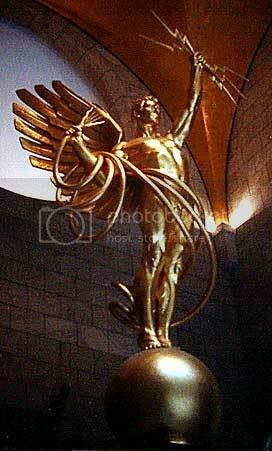 The Cydonians themselves can trace their lineage back to Samothrace and worship of the Cabiri. * Scholars are also at odds over the meaning of the Cadmus myth itself, with some arguing it represents the influx of Phoenicians and Phoenician learning into Greece, bringing along gods like Heracles, Dionysus, Astarte and Adonis. †Apeulius actually uses the term "secret rites"